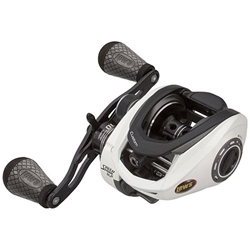 Lew's Custom Speed Spool SLP casting reel is a 10-bearing system with 9 stainless steel double shielded ball bearings and Zero-Reverse one-way clutch bearing. The speed dial provides quick and easy line recognition and the rugged carbon fiber drag system provides up to 14 lbs. of drag power.